There is something about walking with a message. God instructed Jonah to walk through the capitol of the brutal Assyrian empire denouncing its violence and calling for repentance. Jesus and his community walked over 100 miles from Cesarea Phillipi to Jerusalem to confront the authorities on behalf of their occupied and oppressed people. Benjamin Lundy, John Woolman and other early Quakers walked thousands of miles to meet and try and convince slave owners to free their slaves. Gandhi and friends walked to the sea where he illegally picked up a handful of salt and began a nonviolent revolution. In 1943 Bulgarian Jews and supporters marched in refusal of deportation orders, saving themselves from the death camps. Dr. Martin Luther King Jr. and others walked from Selma to Montgomery, Alabama, pressing for voting rights and recognition as human beings. In 1961 pacifists walked from San Francisco to Moscow calling for unilateral disarmament. Inspired by these and countless other walks, marches, parades, religious processions, and pilgrimages for peace and justice throughout world history, the Norfolk Catholic Worker, Norfolk OffBase and a host of friends are planning to go On the Road to No War: A Walk for Disarmament from Camp Peary to Naval Station Norfolk from June 22-26. Taking to the most militarized place in the western hemisphere, the walk will go from one local military base to another, with vigils at the gates of thirteen installations in all. We believe now is a good time for such an enterprise. Casualties and refugees from the various fronts of our “War on Terrorism” are in the millions, civilians the main victims. As the government ratchets up its wars in Afghanistan and Pakistan, plans on leaving 50,000 US troops in Iraq even after “pulling out” (contractors and mercenaries not included), continues to kidnap and imprison or assassinate suspected enemies around the globe, expands the Army and Marine Corps, and proposes a $534 billion military budget for FY 2010 (a 4% increase over 2009 and just one part of over $1.5 trillion to be spent all-told on war next year including financing), our nation’s faith in war runs as deep as ever. 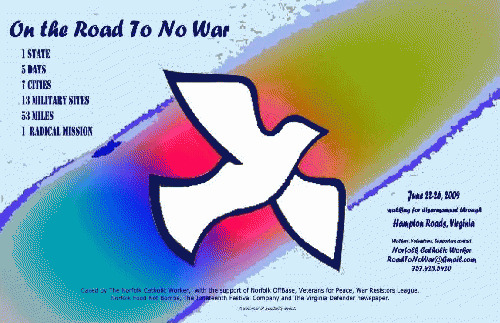 The walk will call for complete unilateral disarmament, for nonviolence instead of warfare, for converting swords into plowshares--the complete transformation of our war-based economy into one that meets human needs--and for nonviolent civilian-based defense rather than reliance on our standing army and weapons stockpiles. True national and global security requires economic justice, defense of the environment, and commitment to nonviolent conflict resolution. The United States could lead by example through dismantling its global military and economic empire and initiating a global disarmament race. We will begin on the Peninsula at the CIA training facility, Camp Peary, in Williamsburg, then walk to Yorktown Naval Weapons Station where the Navy’s bombs and bullets are stored when not shipboard, and on to Ft. Eustis, home to US Army Transportation Corps. Day two will take us from the F-22 and F-15 squadrons at Langley Air Force Base in Hampton to Virginia’s largest private employer at Northrop Grumman Newport News, the only builder of aircraft carriers in the country and one of only two submarine builders. Day three we’ll begin our Southside trek on Harbor View Blvd. in Suffolk where four of the top five weapons makers all have offices within two blocks, Lockheed-Martin, Boeing, General Dynamics, and Raytheon. From there we’ll go to the war-gaming center at US Joint Force Command’s Joint Experimentation Program and Joint Futures Lab, and finish at Norfolk Naval Shipyard in Portsmouth where, among other ships, they service the east coast Trident submarine fleet, the most lethal weapons in the world. The fourth day we’ll hike Virginia Beach from Army transportation at Fort Story, down the oceanfront tourist strip to Oceana Naval Air Station, home to F-18 Hornet Naval air wings, and on to Dam Neck Fleet Training Center and its warfare schools and Navy SEALS base. The final day we’ll visit the rest of the local SEALS (Navy Special Operations troops) at Little Creek Amphibious Base and end the walk at Naval Station Norfolk, the largest Navy Base in the world. The walk will cover some 9 to 13 miles per day, stop to vigil at the different sites, have time for passersby wishing to talk, display signs, pass out leaflets, reflect, and pray. There will be floor space available at churches for those needing sleeping arrangements during the four nights. We’ll need walkers, support vehicles, drivers and cooks. If you are interested in involvement in any way, please contact us at 757-423-5420. The Biblical message to beat swords into plowshares, study war no more, treat others as ourselves, love even the enemy and to be not afraid is a clarion call for nonviolence in both personal and political life. Come join us in hopes that our 50-mile journey will bring us a step or two closer to disarming our hearts as well as our nation.